OTTAWA, Canada -- The "Magnitsky Law" is a piece of Canadian legislation, not yet enacted, that seeks to hold governments and individuals to account for human rights abuses. Nataliya Magnitskaya holds a portrait of her son, Russian lawyer Sergei Magnitsky, in November 2009 in Moscow. The Magnitsky Law, a piece of Canadian legislation not yet enacted, is named after the lawyer, who died in a Moscow jail in 2009 after accusing officials of tax fraud. It's named after Russian businessman Sergei Magnitsky, who died in a Moscow jail in 2009 after accusing officials of tax fraud. It could help to bring sanctions to other rights abusers in other countries. 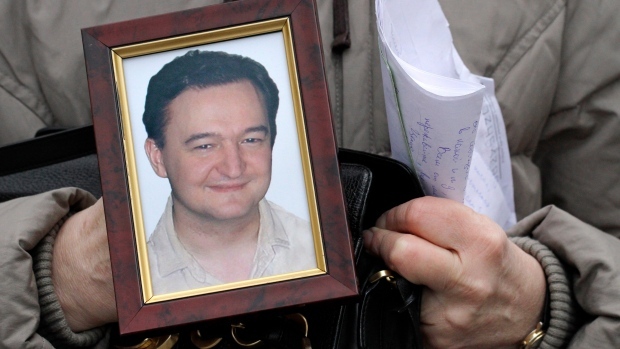 In late 2012, the United States adopted the so-called Magnitsky Act, which imposes travel bans and financial sanctions on Russian officials and other individuals believed to have been involved in Magnitsky's death. But there's something about the way the bill is moving forward in Canada that should perhaps give pause to legislators. Two versions exist: a Commons version written by Conservative James Bezan, and a Senate version written by Raynell Andreychuk. That second version yesterday obtained the support of Canada's Foreign Minister Chrystia Freeland, who says the Trudeau government will help to push it through the House. What do Bezan, Andreychuk, and Freeland all have in common? All three are active members of Canada's Ukrainian community. And all three happen to be among the 13 Canadians sanctioned by Russia for their supposed hostility to the country. The situation may allow the Kremlin to tell its citizens that the bill is not really about rights abuses, but rather part of a campaign motivated by ethnic animus towards Russia. Pro-Kremlin news media and bloggers often portray Canada's Ukrainians as this country's version of Miami Cubans, a community calling the shots of Canada's foreign policy on the one issue that obsesses it. Last year Russian Foreign Minister Sergei Lavrov accused the Canadian government of "blindly following the demands of rabid representatives of the Ukrainian diaspora in Canada." Canada's response perhaps did little to defuse that Russian suspicion. "We will not tolerate from a Russian minister any insult against the community of Ukrainians in Canada," then-Global Affairs Minister Stéphane Dion responded in the House of Commons. "Ukrainian Canadians, we owe so much to them. We will always support them." Human rights groups have welcomed the Magnitsky Bill, and it has enjoyed support from Russian dissidents Gary Kasparov and Zhanna Nemtsova, the daughter of murdered opposition leader Boris Nemtsov. It's also intended to reach far beyond Russia, says MP Bezan. "This will apply to all countries, whether it's organ-harvesters in China who are falsely imprisoning Falun Gong practitioners to harvest their organs and tissues for sale around the world, whether it's people in the Iranian regime that are denying justice and freedom to their own citizens, or even in the case of Saudi Arabia, where they're targeting people who've tried to speak out against the government, this law has global application." "The Russians can say what they want," says Andreychuk. "Ukrainian-Canadians are Canadian citizens. This bill certainly has the support of many Ukrainian-Canadians, but the support that I've received for this bill has not just been from them." "It isn't going to be centred on Russia, though no doubt there are cases of individuals that this will apply to in Russia." A government source close to the negotiations around the proposed bill echoed that thinking. "We don't see this bill as being Russia-specific, but rather as providing us with more targeted and modern tools to use sanctions globally in cases involving human rights." But the Russian Embassy this week issued a "Comment on anti-Russian activities in Canada." "We are compelled to warn official Ottawa that we consider its strong support for a Canadian version of the U.S. Magnitsky Act, as a means to make unsubstantiated human rights claims against Russia, to be another openly hostile move. Should the Canadian Parliament approve this punitive legal act, it would seriously damage relations between our countries, which are not experiencing the best of times already." The Russians also raise wartime abuses by Ukrainians as a way of flagging what it sees as hypocrisy on human rights. Fraught memories of the Holodomor, the Stalin-induced famine of the 1930s, and of the Second World War, strained the relationship between Canada's Ukrainian diaspora and Russia long before the current Ukrainian conflict. Pro-Kremlin websites have raised the record of Foreign Affairs minister Chrystia Freeland's grandfather, Michael Chomiak, alleged to have worked for a pro-Nazi newspaper during the war. The website of the Russian Embassy in Ottawa includes a picture of a stone monument to victims of a massacre by a Ukrainian SS division, some of whose members ended up in Canada. Canada ignored a request from Russia to extradite Nazi war crimes suspect Vladimir Katriuk in 2015. Katriuk, accused of murdering Soviet partisans and civilians, died shortly afterwards in Ontario. David Matas, legal counsel for B'Nai Brith Canada, is also critical of Canada's handling of Katriuk and another suspected SS guard, Wasyl Odynsky. He wrote in March: "The organized Ukrainian community urged cabinet not to revoke the citizenship of two ethnic Ukrainian individuals, Vladimir Katriuk and Wasyl Odynsky, even though the courts had found against them. The government of Canada acceded to this political pressure, despite the court rulings." The influence of right-wing Ukrainian diaspora nationalists ("Banderists" as they are called by the Russian media) is played up publicly and is central to public understanding of the current Ukrainian conflict. Because the Kremlin has been able to portray current events in Ukraine through that lens, ordinary Russians have supported the war. Bezan, Andreychuk and Freeland can all fairly claim to have a track record of promoting human rights generally, but the three are also more than casually involved in Russian and Ukrainian affairs, as is apparent at a glance from their social media. James Bezan's Twitter account shows him meeting in recent days with a Ukrainian parliamentary delegation and Ukraine's ambassador to Canada. Senator Andreychuk's account shows her in Kiev last month, attending a security forum and "condemning Russian aggression & support 4 Ukrainian sovereignty". Another shows her posing on the steps of Parliament with Canadian and Ukrainian flags. At the time of writing, eight of Andreychuk's last 10 tweets were about Russia or Ukraine (none of them about the Magnitsky law). The Magnitsky bill may do good service in the cause of justice. But its proponents' association with Ukrainian causes will inevitably be used in Russia to dismiss it as just another diaspora poke at the bear.